"The Cry of Love" is a posthumous compilation album by Jimi Hendrix. It includes new material that he was working on for his planned fourth studio album. The songs were selected by recording engineer Eddie Kramer and drummer Mitch Mitchell, who are also credited with producing the album. Released on March 5, 1971, by Reprise Records in the United States and Track Records in the United Kingdom, the album was successful on the record charts in both countries and was eventually certified platinum by the Recording Industry Association of America (RIAA) in 1998. Critics responded favorably to the album, viewing it as an impressive tribute to Hendrix. Several of the songs on "The Cry of Love" were later featured on other efforts to recreate the album Hendrix had been working on, including "Voodoo Soup" in 1995 and "First Rays of the New Rising Sun" in 1997. "The Cry of Love" featured songs Hendrix had been working on at the time of his death and was the first attempt at presenting his planned first studio recording since the breakup of the Jimi Hendrix Experience. "The Cry of Love" is composed mostly of songs which Hendrix recorded in 1970 at his new Electric lady Studios in New York City with drummer Mitch Mitchell and bassist Billy Cox. About half of the album's ten songs were nearly completed with mixes prepared by Hendrix. The balance were in varying stages of development and were mixed (and some overdubbed with new parts) after his death. 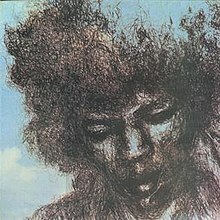 Two songs originally planned for The Cry of Love, "Dolly Dagger" and "Room Full of Mirrors", were instead held for the next planned Hendrix release, "Rainbow Bridge"; they were replaced by "Straight Ahead" and "My Friend". The album credits Hendrix as a producer, as well as long-time recording engineer Eddie Kramer and Mitchell, who prepared the final mixes and track selection, with input from manager Michael Jeffery. Seven of the songs on "The Cry of Love" were later included on "Voodoo Soup", the 1995 attempt by producer Alan Douglas to present Hendrix's planned album. In 1997, all were included on "First Rays of the New Rising Sun", along with seven other songs, in Kramer's most realized effort to complete Hendrix's last studio album. "The Cry of Love" was released on March 5, 1971. The album entered Billboard's Top LPs chart in the US at number 17 on March 6 and eventually reached number three. By April, it sold 500,000 copies and in 1998, the Recording Industry Association of America (RIAA) certified the album platinum, which indicated sales of one million copies. In the UK, it entered the UK Albums Chart on April 3, where it peaked at number two. It isn't just the flow—these tracks work as individual compositions, from offhand rhapsodies like "Angel" and "Night Bird Flying" through primal riffsongs like "Ezy Ryder" and "Astro Man" to inspired goofs like "My Friend" and "Belly Button Window." What a testament. In the Encyclopedia of Popular Music, Colin Larkin later called "The Cry of Love" a "fitting tribute" to Hendrix, while Paul Evans wrote in The Rolling Stone Album Guide that it "showed the master, playing with Cox and Mitchell, at his most confident: 'Ezy Rider' and 'Angel' are the tough and tender faces of the genius at his most appealing." Dan Bigna from The Sydney Morning Herald believed although all of its songs were compiled on the more comprehensive "First Rays of the New Rising Sun" (1997), "there is something satisfying about having this first posthumous Hendrix release as a distinct object that illuminates the brush strokes of a genius". In 2014, VH1 deemed The Cry of Love "the greatest posthumous classic rock record of all time". That same year, it was reissued in both CD and LP formats by Experience Hendrix. UK Track 2408 101 stereo (1971). Album produced by Jimi Hendrix , Eddie Kramer and Mitch Mitchell. The album's hinged cover is in excellent condition, displaying only minor signs of wear.